With bloody fangs and his cape held out wide the dreaded Count Dracula is ready to sink his teeth into his next victim! He is an ideal model for spooky theming in a Halloween or Horror scene. 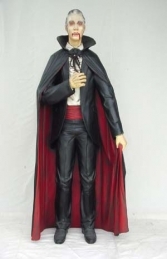 This instantly recognisable vampire figure of Count Dracula is full of scary detail; from his blood-shot eyes and dripping fangs to his black and red evening dress and opera cape. This model vampire looks superb on his own, with our Bat models (JR 1603) and our large bunch of Garlic (JR 2516), or with our Soul-taker, Witch and Frankenstein Monster figures to create a fang-tastic Halloween display. This popular Dracula model is also avaliable as a photo-opportunity "Peep-through" model (JR 1429-F). PLEASE CONTACT US ON 01626 833646 or 07860 680181 TO DISCUSS THIS MODEL & THE OTHER FIGURES IN OUR HALLOWEEN & HORROR THEME SERIES. PLEASE PHONE US TO PLACE AN ORDER & FOR A QUOTE FOR DELIVERY COST TO YOUR POSTCODE.